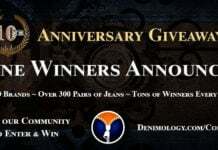 This week’s give away is sponsored by Portuguese denim label Salsa Jeans, who are giving away $300 worth of women’s jeans to one lucky winner. Salsa Fits My Life is an international lifestyle brand with denim, sportswear, footwear and accessories for men and women established in Portugal in 1994 and present in more than 30 countries. Known for its unique and independent style, the Salsa fan is dynamic, self-confident and passionate about life. those jens are great,WHERE CAN I BUYED?